The town was of rectangular layout and measured 1758.6 by 1635 metres. The enclosed area comprised 3 square kilometres, or 288 hectares. 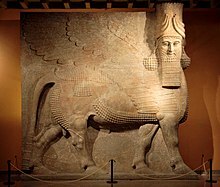 The length of the walls was 16280 Assyrian units, which according to Sargon himself corresponded to the numerical value of his name. The city walls were massive and 157 towers protected its sides. Seven gates entered the city from all directions. A walled terrace contained temples and the royal palace. The main temples were dedicated to the gods Nabu, Shamash and Sin, while Adad, Ningal and Ninurta had smaller shrines. A temple tower, ziggurat, was also constructed. The palace was adorned with sculptures and wall reliefs, and the gates were flanked with winged-bull shedu statues weighing up to 40 tons. 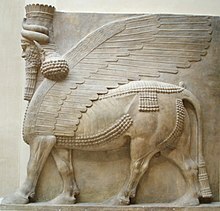 Sargon supposedly lost at least one of these winged bulls in the river. 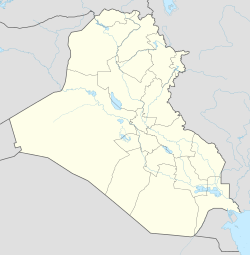 This page is based on the Wikipedia article Dur-Sharrukin; it is used under the Creative Commons Attribution-ShareAlike 3.0 Unported License (CC-BY-SA). You may redistribute it, verbatim or modified, providing that you comply with the terms of the CC-BY-SA.